Perfectly portable steel retractable pen with secure metal clip guarantees your pen will be there when you need it. Combining style, strength, and value this is Canada's number one steel ballpoint pen for a reason. The Original 3-Series features a sleek, sophisticated appearance housed in a rugged steel body for lasting performance at a value. 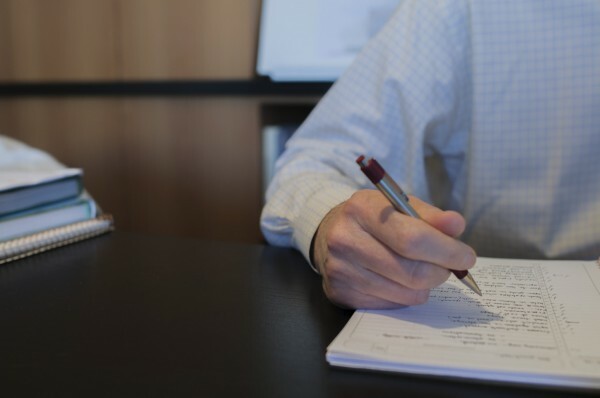 The F-301 Ballpoint Retractable Pen is ideally sized for pocket transportation and features a metal clip for a secure clasp. Refillable with F-Refill. Just bought a pair of these at Fry’s Foods (Kroger). Have been using the F-402 which is considerably heavier. Good work pen. It is pure pleasure to use these pens and to write a review of them. I consider these to be the best pens on the market. They are certainly the best, most reliable pens I have ever used. It is hard to find the F-301 in my local stores as the Z-Grip seems to be preferred by purchasing managers (which is still a very nice pen). It is good to know that I can get the F-301 directly. These are without doubt or hesitation, the best pens on the market. Because of their smoothness, my penmanship is beautiful. I enjoy going back to my notes and seeing my handwriting. I know it sounds silly but I do. Recently, I bought some off-market refills by the name of “Penatia Zebra Refills” that I found on eBay. What pieces of Chinese crap. Don’t fall for the same mistake. Just buy the real thing. BJ’s Warehouse has good deals on these pens, in fact I think I’ll go now and buy some more! I usually dont review many products but i feel this one deserved it! The F-301(bp) is the only pen i ever use now since i discoverd it by accident when someone left it at my desk.I only wish they made more colors besides the red,black and blue. I also want the green pen but cannot locate it on line. I like the four pack so bought several of them at Staples, which included the green; yet no refills available. I have used the gel for years but now have gone back to my original Zebra which is so much easier to use and does not bleed through my planner pages. Awesome!! I love the Zebra pens. They write well, and the colors are solid. I wish I could get refills for the green and black pens. I am an engineer and work in manufacturing facilities. Tough environments for a pen. I came across this brand and have used it exclusively. Always gets the job done. I dropped, bent and even washed these pens and they still work. Simply a great product. Again I go back to staples and buy a zebra pen. This zebra pen has an amazing fine tip which is so fine and yet perfectly smooth to write with.. Not to mention its amazing looks and feel. I really prefer the lightness of this pen to anything else I’ve tried. 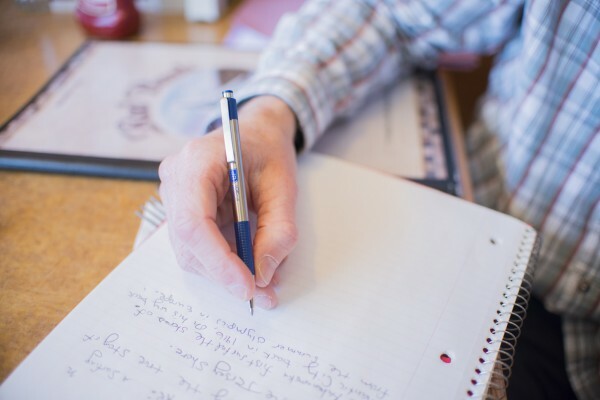 Its solid metal and hard plastic make it feel amazing in your hand, and confident in your writing. I just bought the 4 color variety pack at staples and am amazed at how well the tip and ink work. The thinness is really a plus due to the small amount of ink that comes out, making bolding words, note doodles, or a drawing, a dream because of how it shades deeper after a second, third, pass over. So they look good, run good, feel good, are good… Im not sure ill buy a different pen.. ever. That being said, the body of the pen is slightly shorter than the average pen (which I prefer) meaning it will hold less ink per cartridge. I didn’t mind. I also had never used the same pen for so long (made sure I never lost it) Once I got used to buying cartridges, I didn’t look back. No matter how you write it, this is a great great GREAT pen. And I couldn’t be happier. Thanks Zebra. I have had issues with the 301 pens. I use them for about 2 weeks and then they stop writing. I have sent 4 emails to there customer service, and never have gotten any response. Hi Scott, sorry for the inconvenience! Our Customer Service team has been notified and you should receive a response by the end of day today. These pens write wonderfully for about a month. I can’t even use mine anymore because it doesn’t write. The ink flow cuts in and out all the time. I an really disappointed because they work so great in the beginning, but then it stops working! Hey Hailey, so sorry you’re experiencing problems with the F-301! Please contact our customer service team explaining the situation and we would be more than happy to send replacement refills for your order! The f301 is the most underrated pen I tell you. The one pen that forces me to leave Parker Jotter (I admit Jotter looks better) in th drawer because of its comfort and nice line it produces. And I can write long due to its lightness and plastic grip as compared to Jotter which feels good but cannot use for longer periods. I only use f301 mostly in fine tip and sometimes medium and bold tip. Just need to marker green color more (so I don’t have to go on ebay and such) and introduce a new color like maybe aquamarine color? These never fail. I have used these for years and don’t any others. I really love these pens, and I always bought the black ink and never had any problems. I recently bought a two pack of blue ink pens and they don’t write- well only when they want to. I was pretty disappointed, when I found this out while taking notes in class. Hi John, sorry you’re having a negative experience with our product. We guarantee the performance and quality of all our products, please reach our to Customer Service team to arrange for replacements to be mailed to you! 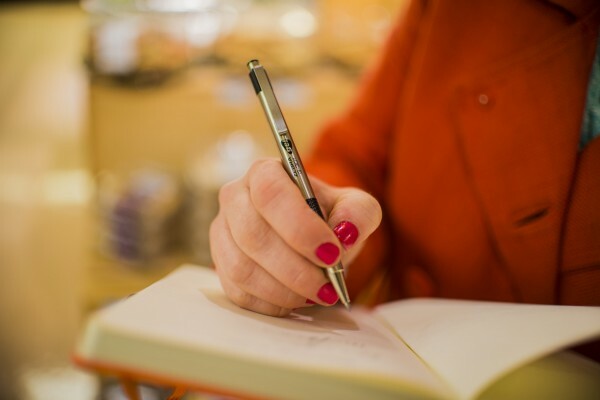 As a nurse, I do a tremendous amount of writing on a daily basis and I have tried virtually every pen on the market. Nothing beats the F301, especially the 1.6MM Bold tip. I write with a heavy hand and other pens end up shredding the paper I’m writing on. I buy these in bulk from Amazon. I just wish I could buy replacement certridges in bulk as well because the ink runs out long before the pen itself breaks down. These pens never skip and have the smoothest ink flow of all my pens in my collection (Jotter, IM Rollerball, and Signo 207). It would have been much better if the F-301 models had a rubber grip like the F301 Ultra. Easily the most consistent and reliable pen you can buy today. Also, the seem to write on anything, so I always try to keep one with me. I have used the F-301 0.7 mm point for years and have yet to find a better “go to” pen. I love the fact that its body is metal, and it is always consistently reliable. There is little room for improvement, but I think a few things could make this pen near perfect: 1. I tend to click my pens a lot and sometimes the clicker button falls off. I would like it if that wouldn’t happen because sometimes I can’t find it. 2. I think it’d be nice to have more color choices for the grip on the body. 3. Lastly, but perhaps most importantly, it would be awesome if the ink was a little darker (like hybrid ink), but where it wouldn’t compromise the performance and become globby. I have used the 1.6 mm tip and enjoy the dark ink, but it tends to glob a lot and leaves a mess on the paper sometimes. With all that said, this is a great pen, especially the 0.7 mm point, and I haven’t found anything better yet. It is great for writing as well as drawing (great shading with it). You really can’t go wrong. Thank you for your feedback! I will make sure product development is aware of your suggested improvements! I LOVE THIS PEN SO MUCH!!! It rights very well. This is my favorite pen; comfortable, compact, no-worry performance, etc. The only problem is that everyone else tries to swipe it from me! I think they’re great. I have had this same pen for five years. It has traveled with me to the depths of Tartarus. The pen does its job, simple as that. It’s easy to hold, and doesn’t cramp me up after extended use. I occasionally go a few weeks without using it, but it doesn’t dry up and is easy to use again after that time. I’m very please and would recommend this product to anyone. I like the way the pen writes, my only problem with the f301 is the plastic barrel, the threads always seem to break off with half the ink still in the pen, I just toss itand buy a new one. I do a lot of reading and these pens are the best I have ever found for notation in research. They are a dream to writing with. My only complaint is that it is hard to find red refills over the counter. You can only get a red pen with the purchase of a 4 pack. I have to buy a 4 pack (2 black, 1blue, and 1 red just to get a red pen. Of course I use the black as my standard legal pen, but why is it so hard to find red fills? This pen is great for its fine point and durability, but for writing, the ink goes in and out. I constantly find myself needing to rewrite what I just wrote down due to the ink not coming out consistently. Now I know why pens advertise “smoothness” when writing. This pen does not write smooth! Looking at Jackie’s comment I would have to agree. This pen has very little for improvement. After 9 years in the military I refuse to pick up another pen. I have found, in my current profession, that the 301 holds strong and true. The flow of the ink is smooth, there is no mess or smudge, and I have yet to have a refill fail on me. The button coming loose is a minor annoyance but can easily be over looked. 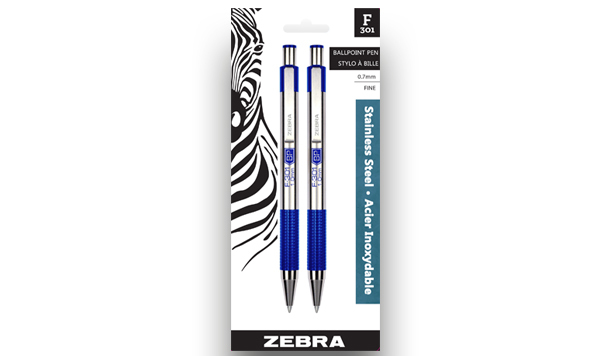 In fact, I just purchased an order of refills for my entire department because we all swear by Zebra’s 301. I can’t wait to get the nerve to try the 701!!!! Keep up the good work Zebra. 5 stars for certain. My first F-301 was perfect. Even after being run over, it kept writing; so i started buying them. However, two of my recent pens have simply broken off where the plastic grip meets the steel tube. Maybe Zebra changed manufacturing parameters. In any case, Zebra’s warranty requires return postage (almost the cost of the pen) or an online discount. Neither option fits well with a superior pen manufacturer. When I originally starting using the F-301 (7MM) 10 years ago, it performed GREAT! Now, the pen and refills are totally inconsistent within 2 weeks of purchase. The ink skips and does not leave an even flow. By the time I finish making an entry in my flight log, it looks as if the ink is drying up. Did someone switch suppliers and ink formula? Love, love, love this pen. I can’t imagine anyone having a problem with it. I believe whomever has experience any sort of problem with it, must have bought a knock off somewhere. There are so many praises sung within these reviews that all I have to say is Here! Here! I’m in perfect agreement with all of you who love this pen. Thank you Zebra…word of caution… please never stop making this pen, you might have a stampeed of unhappy customers! Truly top of the line without spending a fortune. 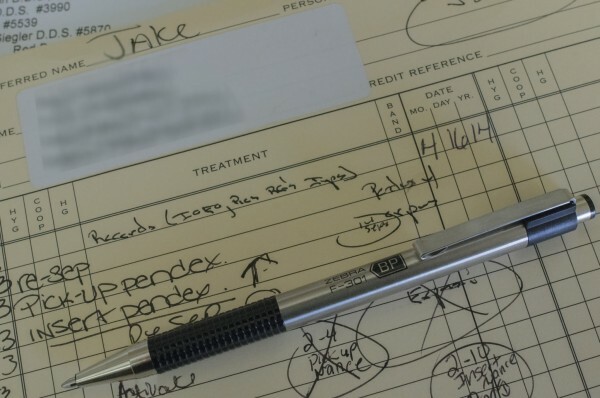 The Zebra F-301 is a great pen, and Zebra customer service has been great when I’ve had defective refills. HOWEVER, like others, I wish Zebra would have RED refills available in the .7mm point. My go-to red pen is about out of ink, and buying a whole new F-301 red pen just for a simple refill is against environmental principles. Zebra, don’t let us frequent users and devotees down! Really like the 301. Having said that, I don’t care for the plastic (threaded) barrel. Didn’t see any reviews on the 701, does it also have the plastic threaded barrel or is it solid metal? I carry mine in my work apron and it outlasts plastic pens by far but they do break at the plastic. Is the 701 any larger in the grip? Again greatest pen I’ve ever used and will continue to purchase them as they break but would prefer completely metal barrel. Hi Ron. We’re glad you like our F-301. 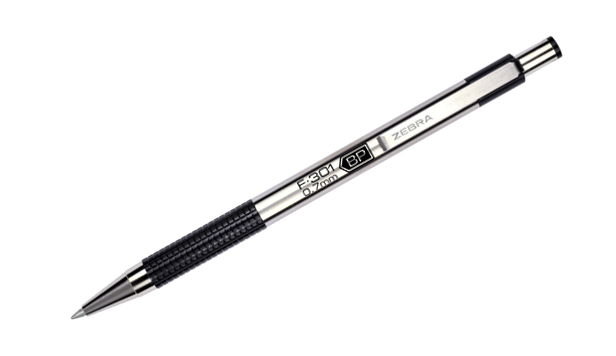 The F-701 is a little longer and heavier than the F-301, and it has a knurled metal grip. The f-701 is all metal, with the exception of the plunger mechanism and refill. Watch this space for future product updates! This is kind of your average pen. There’s nothing special about it but I do like the steel barrel. I have used the F-301 .07 pens for the past 7 years and I loved them up until recently. The past pack and 2 packs of refills have been sub par. Through those 6 ink cartridges they all began to write intermittently. Like I said I used to love them but, the quality isn’t there anymore so I have to look for something different. I have been using this pen for a several years, but recently very disappointed. I buy these in 12 packs and take them everywhere with me. I literally do not write with any other pen and I’ve been through a lot. But they suddenly just STOP WRITING. Out of NOWHERE. I have been saving all of these pens and now I have a total of 6 pens which have ink in them, but they just don’t write. This is unacceptable for the price you pay for these. I don’t want an apology letter, fix the problem and replace these pens please! I was forced to write with other pens because I need a product that is reliable. If you are manufacturing a pen, it should write until the ink runs out. No exceptions. And only 2 pens for the past 4 years have done that. NOT GOOD!! If you write with these pens the way I do, you will notice the same issue. it is nice pen and i like the feeling of holding a light elegant steel pen with beautiful fine line. i would like this pen more if the blue ink colour is little bit darker. i bought a pack of two one of them stopped writing on its own after writing with it couple of times; i took a look on the ink tube but it is still full! F 301 FINE, like them. Can’t find any place where I can buy refill cartridges. Do I have to throw these nice pens in the garbage? I live in Merrickville ON. Hi Fred – great to hear that you love our F-301! Refills are available at either Staples or Wal-Mart stores across Canada, or you can also buy directly from our website.